The air was crisp, as the wind blew in a faint chill. The snow, covered the ground like a blanket. I was leaving my tracks in the soft white powder as I trekked along the trail being careful not to veer off into undesignated country. I found this sign to be a metaphor for my life. The path in front of you is looking pretty nice. The golden leaves are atop the new fallen snow and the only prints to be found are that of a squirrel and a deer or two. But then you look to the right and to the left and ohhhhh… it’s even more beautiful. The untouched snow, looks like a cloud you could just jump on to and float away. You stop. The beauty has begun to disappear. ” What happened?” you ask yourself. The temptations crept in and led you astray. It isn’t at all what you thought. You were lured into a place with only temporary joy. You attempt to find your way back to the designated trail, hoping there is something left that can add to your confused place in life. We often times deviate from what is in front of us because we are curious of what lies beyond. Ironically, the trail we were on all along was better than the trail we shifted to. For some of us, it takes a few shifts to figure that out. It’s okay to walk alone. God is always with you. You need that time to become heathy and strong so you can receive others who may want to join you. It may be someone who was on your path once before, but now you and they have grown. As a wise friend once said to me, God has a plan for us, if we get off the path and make a few mistakes along the way, he’ll still get us there, it just might take a little longer. The path we walk can be slow at times. Just put one foot in front of the other and keep moving forward. God has your back. 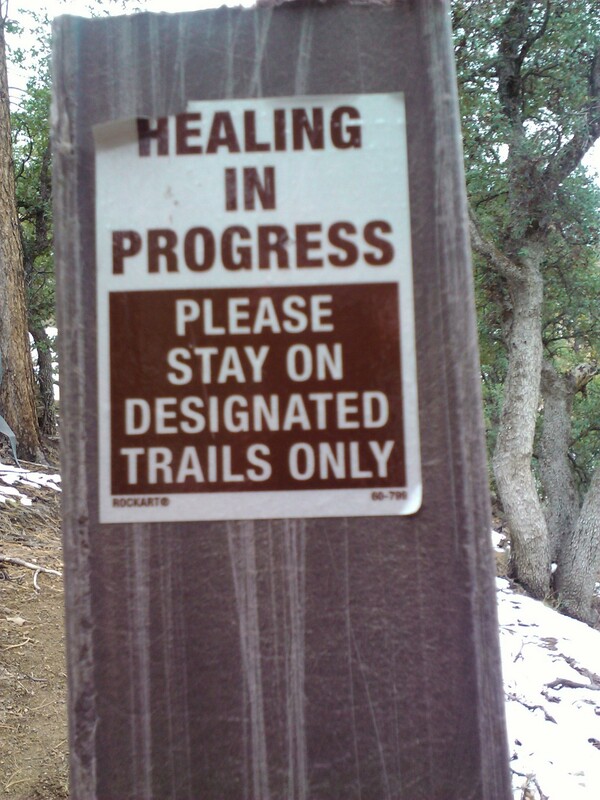 Remember: HEALING IN PROGRESS, STAY ON DESIGNATED TRAIL!